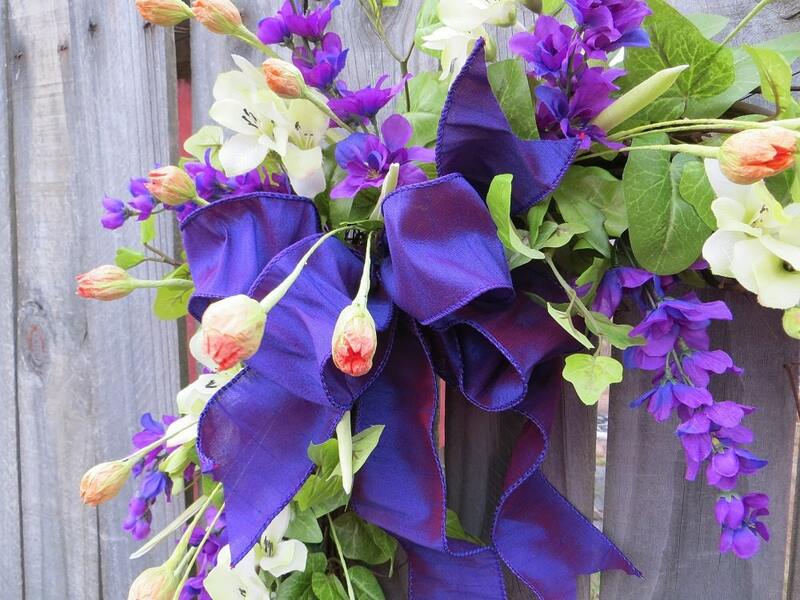 This beautiful, elegant bow is made with 2.5" purple wired faux silk ribbon, and is the perfect embellishment for a standard size door wreath (see the second photo to see how the bow looks on an 18" grapevine wreath). The bow is made up of four loops, two short streamers, and two long streamers of differing lengths. The wire on the edges allows for easy re-fluffing! 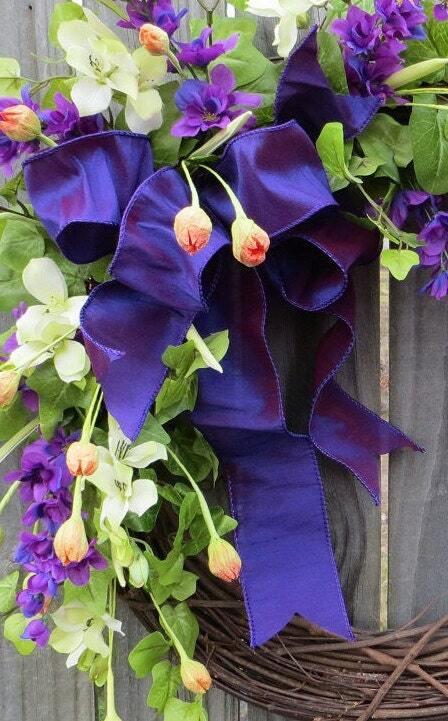 This bow would also be perfect to decorate lanterns, arrangements or any other item you would like to embellish! 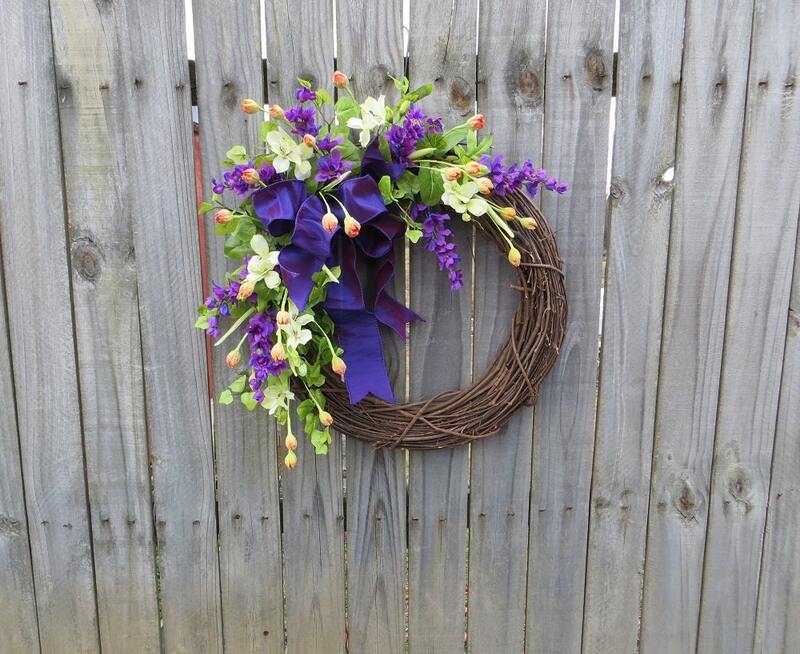 The bow is tied using a 12" chenille stem wire, which can be used to attach the bow to a wreath or other object. 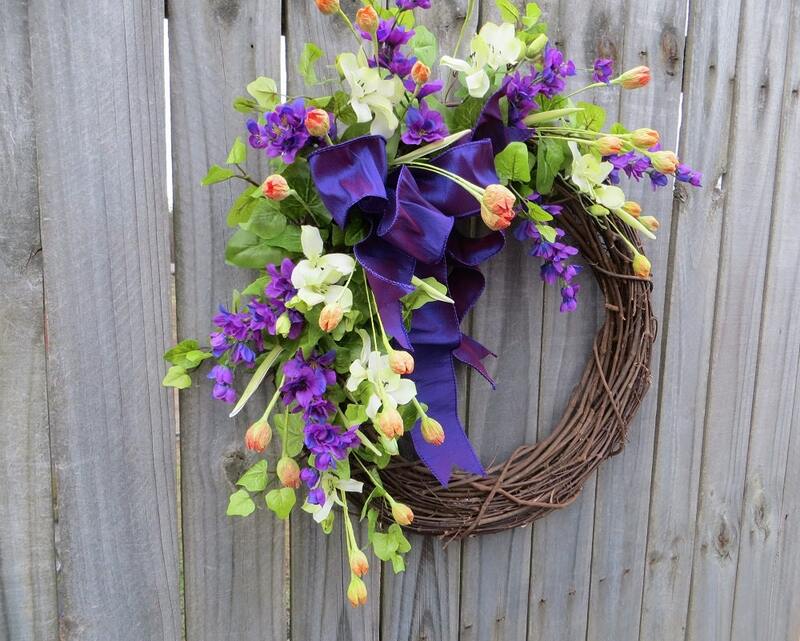 This bow is for use in indoor and sheltered outdoor areas. Your bow may require a bit of fluffing upon arrival. Please note that this bow is made to order; therefore, due to its handmade nature, there may be slight differences between the bow in the photo and the one you receive. DURING CHECKOUT, BE SURE TO MAKE SURE THAT YOUR SHIPPING ADDRESS IS CORRECT. We will always attempt to make your order as fast as possible! Take a look at each listing under the "Shipping and Polices" tab for current ready-to-ship times. If your order is a custom order, we may require additional time to complete it. We will mark your item shipped when we have shipped it. You will receive an email notifying you of the shipment and tracking information, also. *Horn's Handmade is not responsible for losses or damages during shipment but will do our best to work with UPS or USPS to retrieve the item if loss occurs. If there is any issue with your order, please contact us so that we will discuss the issue. Please do not use the feedback system to notify us of an issue. We would love to sort out any problems involving your order. We want you to be completely satisfied! If you aren't satisfied with your purchase, please contact us as soon as possible after you receive your order. After contact is made, the item must be on its way back to us within 5 business days to receive a refund. We must receive the item before a refund/exchange is issued. Customers are responsible for shipping fees associated with returns. Once we receive the item in good condition, we will immediately refund your original payment minus shipping charges. Shipping costs are non-refundable. Please convo us if you have any additional questions regarding our refund/exchange policy. Again, we want you to be completely satisfied! We try to take evenings and Sundays off from correspondence. Please feel free to convo us anytime. If it is after hours, we will attempt answer sometime during the next business day. We love to hear your feedback! Please contact us if there is an issue with your order before leaving anything other than 5 star feedback. We will gladly work with you to resolve any issues.